Raised as a Christian Scientist in upstate New York, Charlotte McGuffey has always striven to be perfect and has trusted the power of her thoughts to protect her from life's troubles. But when her newly estranged husband dies on a trip out of town, leaving her to raise their two young sons on her own, Charlotte realizes that her problems are too complex for her to master with the power of her mind alone.Accompanied by her boys, Charlotte goes to the family's summer home in Beede, Vermont, WHERE her husband, Mel, was last seen alive, to look for answers about his final days and to grapple with her feelings of confusion and guilt surrounding his death. As Charlotte explores this new world, she is befriended by her neighbors in Beede--a colorful lot who are concerned, helpful, very human, and decidedly imperfect. Among them are a kind and perceptive postmistress/reporter, a garrulous caretaker, and an unlikely suitor--a joyous and charismatic artist at war with conventional thinking.In this eclectic environment, Charlotte begins to explore her own feelings and question the fundamental beliefs she's accepted her whole life. To triumph, she must untangle her family's doctored past and brave encounters with painful truths she has never wanted to face. In this bighearted, lush, and graceful debut novel, Mary Hays portrays the strength of the human spirit in times of crisis and the ways in which community can foster individual growth. 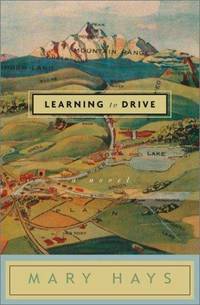 Learning to Drive stakes claim to a world in which all things solid seem to shape-shift, people juggle reality to fit their beliefs, and women are deeply passionate about the choices they make.From the Hardcover edition. 2004-07-03. New. Ships with Tracking Number! INTERNATIONAL WORLDWIDE Shipping available. Buy with confidence, excellent customer service! 2003-05-03. New. Ships with Tracking Number! INTERNATIONAL WORLDWIDE Shipping available. Buy with confidence, excellent customer service! Anchor. PAPERBACK. 1400031907 New Condition. . New. Anchor. PAPERBACK. 1400031907 Like New Condition. . Fine. Shaye Areheart Books. Hardcover. 1400047803 New Condition. . New. 2004-07-03. Good. Ships with Tracking Number! INTERNATIONAL WORLDWIDE Shipping available. May not contain Access Codes or Supplements. May be ex-library. Shipping & Handling by region. Buy with confidence, excellent customer service! Shaye Areheart Books. Hardcover. 1400047803 Like New Condition. . Fine. Shaye Areheart Books. Hardcover. 1400047803 INSCRIBED by Mary Hays on title page. Just the slightest of wear to jacket from handling, otherwise as new. . Fine. 2003. 1st Edition. Shaye Areheart Books. Hardcover. 1400047803 signed with dedication to Kevin, unread / fine condition . Fine. Westminster, Maryland, U.S.A.: Random House Inc. & the Bookworks, 2003. 1400047803 Slight overall wear. Nice, clean, tight, unmarked copy. SIGNED and inscribed by author on half-title pg.. Signed By Author. First Edition. Hardcover. Very Good/Very Good. New York, New York, U.S.A.: Anchor Books, 2003. Slight cover wear. Nice, tight, unmarked copy. Signed by author on half-title pg. From Publishers Weekly: "The world of Christian Science healing forms the backdrop for this story about grief and the conflict between religious faith and physical experience. In December 1952, Charlotte McGuffey re-embraces her Christian Scientist beliefs and announces her intention to take her two young sons, the energetic Baird and the impulsive, autistic Hoskins, and leave her photographer husband, Melvin. Melvin agrees to a trial separation, thinking he will prove the folly of her plan, and departs for their country home in Beede, Vt. Just a few days later he is killed by a young, nervous driver. The following summer Charlotte packs up their belongings and brings the boys to Beede to search for information about her husband's last days alive. The town's denizens-including drifter Paul Bellini, "The Great Bellini," who lives in a nearby communal house and insists on watching over the country place for her, and the fiercely attractive artist Francis-begin to coax Charlotte from her mourning and loneliness. But when her beloved sister refuses medical treatment for the diabetes that killed their Scientist mother, and Hoskins reaches his fourth birthday without speaking an intelligible word (though he perfectly mimics the instructions in a driving manual, hence the title), Charlotte's own faith and healing are sorely tested. Mesmerizing prose and darkly complex characters draw the reader deep into Charlotte's world, raising fascinating questions about the power of mind over body and the emotions that bind the most unlikely people together. Readers who crave a slice of insight with their fiction will find this a thoughtful, provocative book.". Signed By Author!. Soft Cover. Very Good. U.S.A.: Shaye Areheart Books, 2003 first edition/first printing book is tight with no markings, great copy . First Edition/First Printing. Hard Cover. As New/As New. 8vo - over 7¾" - 9¾" tall. Shaye Areheart Books. Hardcover. 1400047803 Remainder mark . Fine. Shaye Areheart Books. Hardcover. 1400047803 signs of little wear on the cover. . Very Good. Shaye Areheart Books New York: Shaye Areheart, 2003, NEW First edition, First printing complete with number line. Helps support Christian Homeschooling family.. Hard Cover. As New. Anchor. PAPERBACK. 1400031907 *BRAND NEW* Ships Same Day or Next! . New. Anchor. PAPERBACK. 1400031907 *LIKE NEW* Ships Same Day or Next! . Fine. Shaye Areheart Books, 2003-09-30. Hardcover. Good. Shaye Areheart Books, 2003-09-23. First Edition. Hardcover. Used:Good. Shaye Areheart Books, 2003-09-30. Hardcover. New. Anchor. PAPERBACK. 1400031907 Ships promptly from Texas. . New. 2004. ANCHOR BOOKS. GOOD CONDITION. TRADE PAPERBACK. Shaye Areheart Books. Used - Very Good. Very Good condition. Very Good dust jacket. New York, New York: Shaye Areheart Books, 2003. First Edition. Hardcover. Fine/Near Fine. Octavo, 9 1/2" tall, 308 pages, gray and brown boards. A fine, clean, neat hard cover with little shelf wear; hinges and binding tight, paper cream white. In a near fine, lightly worn dust jacket, with the original price. Random House Inc, 2003. Trade Paperback - VG - Book is clean and tight with light wear - ARC - 311 pages.. First Edition. Trade Paperback. Very Good. Advanced Reading Copy (ARC). New York: Shaye Areheart Books. Fine copy in fine dust jacket. 2003. 1st. hardcover. 8vo, 308 pp. .
Shaye Areheart Books. Hardcover. 1400047803 Brand new. Any book may show light shelf wear from warehouse storage and handling. . New. Shaye Areheart Books. Hardcover. 1400047803 Ships from Tennessee, usually the same or next day. . New. 2003. Shaye Areheart Books. Hardcover. 1400047803 . New. Shaye Areheart Books. Hardcover. 1400047803 . New. 2003-09-23. 1st. Shaye Areheart Books. Hardcover. 1400047803 Minor shelf wear . Very Good. Crown Publishing Group, 2003. Hardcover. As New. Disclaimer:An apparently unread copy in perfect condition. Dust cover is intact; pages are clean and are not marred by notes or folds of any kind. At ThriftBooks, our motto is: Read More, Spend Less.Dust jacket quality is not guaranteed. Knopf Doubleday Publishing Group, 2004. Paperback. Very Good. Disclaimer:A copy that has been read, but remains in excellent condition. Pages are intact and are not marred by notes or highlighting, but may contain a neat previous owner name. The spine remains undamaged. At ThriftBooks, our motto is: Read More, Spend Less.Dust jacket quality is not guaranteed. Crown Publishing Group, 2003. Hardcover. Good. Disclaimer:A copy that has been read, but remains in clean condition. All pages are intact, and the cover is intact. The spine may show signs of wear. Pages can include limited notes and highlighting, and the copy can include previous owner inscriptions. The dust jacket is missing. At ThriftBooks, our motto is: Read More, Spend Less. Knopf Doubleday Publishing Group, 2004. Paperback. As New. Disclaimer:An apparently unread copy in perfect condition. Dust cover is intact; pages are clean and are not marred by notes or folds of any kind. At ThriftBooks, our motto is: Read More, Spend Less.Dust jacket quality is not guaranteed. Random House Inc, 2003. Trade Paperback - VG - Book is clean and tight with light wear - (Advanced Reading Copy - First Edition) - 311 pages.. First Edition. Trade Paperback. Very Good. Advanced Reading Copy (ARC). Anchor. PAPERBACK. 1400031907 Item in good condition. Textbooks may not include supplemental items i.e. CDs, access codes etc... . Good. Anchor. PAPERBACK. 1400031907 Great used condition. A portion of your purchase of this book will be donated to non-profit organizations. Over 1,000,000 satisfied customers since 1997! We ship daily M-F. Choose expedited shipping (if available) for much faster delivery. Delivery confirmation on all US orders. . Very Good. 2004-10-12. Shaye Areheart Books. Hardcover. 1400047803 BRAND NEW Over 1,000,000 satisfied customers since 1997! We ship daily M-F. Choose expedited shipping (if available) for much faster delivery. Delivery confirmation on all US orders. . New. 2003-01-01. Shaye Areheart Books. Hardcover. 1400047803 Never Read-may have light shelf or handling wear-publishers mark- Great Copy- I ship FAST! . New.